This guide will attempt to organize everything someone living in the Halifax area might want to know about flying out of U.S. airports. 3 airlines fly out of Bangor, and they are Allegiant Air, Delta, and US Airways. The most likely reason someone from Halifax might want to make the trek down to Bangor to fly somewhere is to get to Florida, typically using Allegiant Air. Allegiant is a low cost carrier with flights to Daytona Beach, Orlando, and Tampa (the only 3 destinations they fly to from Bangor). When comparing costs, be aware that Allegiant charges extra for absolutely everything, including even carry-on luggage now. 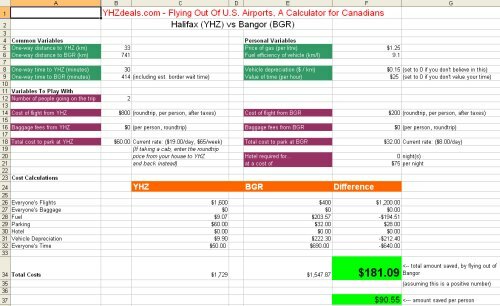 Internationally, flights out of Bangor can certainly be cheaper, but usually involve routes that are at least as complicated or lengthy as flying out of YHZ. It's a smaller airport, and it's biggest strength is usually flights within the U.S. It doesn't hurt to check though, as Delta or US Airways can sometimes have flights that are significantly cheaper than flying out of Halifax. Go to the YHZ vs BGR worksheet and enter in a few variables to calculate what your true savings would be. Using common averages, I've found that if the flight from Bangor is about $500/person less than the flight from Halifax, the average person is only breaking even. In my opinion, when the flight from Bangor is at least $600 less per person than the flight from Halifax, it becomes worth the drive. This is based on my calculations using average factors, and 2 people in a vehicle. You can see the example in the spreadsheet that was used to draw this conclusion. Parking is currently $8/day, according to the Bangor airport website. Is there any public transportation from Halifax to Bangor airport? Cape Air and JetBlue have partnered up to offer flights out of Bar Harbor to a variety of cities across the United States. There is also PenAir which offers flights to Boston and a variety of destinations in Alaska. If you've downloaded the Excel file, please note that you will need to switch to the YHZ vs BHB worksheet at the bottom of Excel. Go to the YHZ vs BHB worksheet and enter in a few variables to calculate what your true savings would be. Using common averages, I've found that if the flight from Bar Harbor is about $500/person less than the flight from Halifax, the average person is only breaking even. In my opinion, when the flight from Bar Harbor is at least $600 less per person than the flight from Halifax, it becomes worth the drive. This is based on my calculations using average factors, and 2 people in a vehicle. You can see the example in the spreadsheet that was used to draw this conclusion. Parking is currently free at Bar Harbor Airport. Is there any public transportation from Halifax to Bar Harbor airport? There are 6 airlines that fly out of Portland (PWM): Air Canada, AirTran, Delta, JetBlue, United Airlines, and US Airways. With a variety of major airlines and low cost carriers, there are certainly cheap flight prices to be had out of Portland. The question is though, how much cheaper do they need to be than flying out of Halifax to justify the 9 hour drive? If you've downloaded the Excel file, please note that you will need to switch to the YHZ vs PWM worksheet at the bottom of Excel. Go to the YHZ vs PWM worksheet and enter in a few variables to calculate what your true savings would be. Using common averages, I've found that if the flight from Portland is about $675/person less than the flight from Halifax, the average person is only breaking even. In my opinion, when the flight from Portland is at least $775 less per person than the flight from Halifax, it becomes worth the drive. This is based on my calculations using average factors, and 2 people in a vehicle. You can see the example in the spreadsheet that was used to draw this conclusion. Parking is currently around $12.00/day, at Portland Airport. Is there any public transportation from Halifax to Portland airport? - you don't value your time as being worth much. The value of time is often overlooked by many people, since it's not as tangible a cost as say, the cost of fuel. But when you do put a realistic cost on the value of your time (let's say $25/hour), it becomes a significant cost. - you consider the drive to the U.S. as having added value (perhaps as part of the vacation itself or a shopping trip). - you have a minimum of 4 people in the car. air canada, delta, us airways, guides, bangor, bgr, portland, pwm, allegiant air, airtran, jetblue, united airlines, bar harbor, bhb, penair and cape air.